I'm still working on the granny square afghan, but I'm thinking about free hand embroidery. It's the first craft I learned. I was stitching handkerchieves when I was 4 or 5. Of course I have no recording of that, but the pictures are showing things I made in 2005. 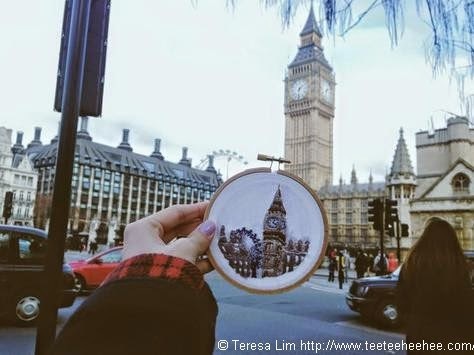 I did a lot of cross stitching, knitting and crochet since then, but since I saw Teresa Lim's travel stitching, I feel like doing embroidery again. 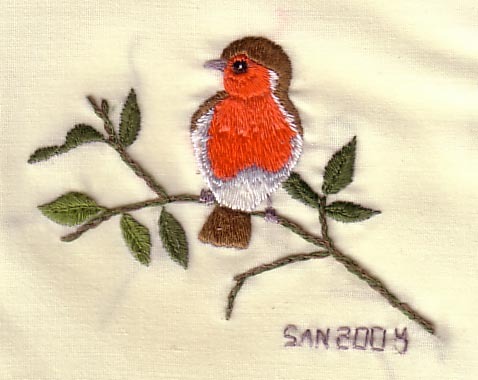 But one crucial question remains : what to do with a piece of fabric with embroidery on it? I don't want to make framed pictures, even in hoops. My walls are filled with cross stitch already. So it's time for a little research of what's out there on the web, and especially on Pinterest. The initial idea is that I would like to transfer my drawings onto fabric, but then what to do with it? - mini doll/cushion type thing. So please give me other ideas !!!! Crafting is an addiction : no matter how much you tell yourself you should stop because you already have too many items, you have to make stuff. It's part of what you are. I managed to stop stitching when I came across my folder of stitched projects that never see the light, but I still need to crochet from time to time. Luckily mom needs potholders and doilies, that's already something. And I'm thinking about trying crocheted fingerless gloves for DBF. 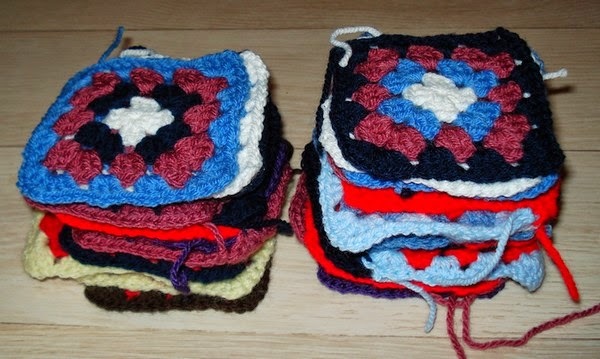 But at the moment I crochet granny squares. 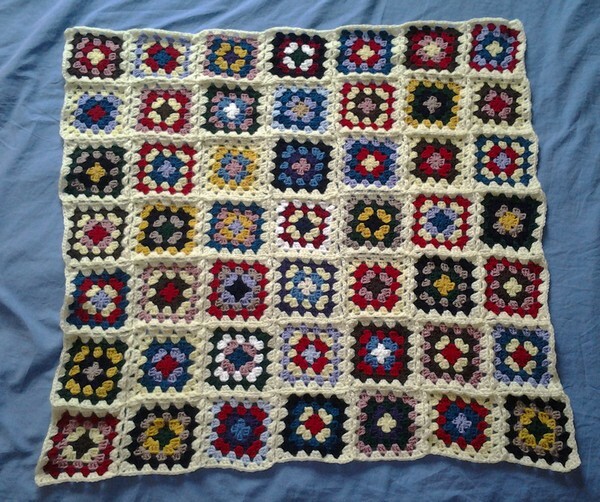 When I see all those lovely afghans out there, I feel a bit ashamed to leave mine in progress for so long. Last time I worked on it was 2 years ago ! That's where keeping a blog is really useful. So for those who just arrived, this afghan is DBF's idea. He wanted a blanket with many squares of many colours, like old times. So I started this in 2011 and I'm still working on it. The random colours are not so random, of course, and it's a good exemple of probability and alternations. The only concern is that I won't haveenough cream colour to link them all. So I will need to make an extra border. But so far, so good. Today I won't writeabout my crafts,but share a "coup de cœur". After all, being inspired by other crafters is part of the creative mind living. So I was just wandering on the web, from Pinterest to Feedly, etc.... when I came across Teresa Lim's website. 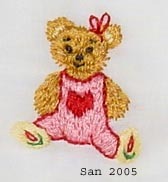 Her originality is to make free hand embroideries of the places she visits. It's such an original idea. Ok, it takes a few hours to make, instead of a few seconds to snap a picture, but it's so much more personal. I've been toying with the idea of having a travel sketchbook, but so far I'm too shy to sit and draw in public. I want to go out and practice locally, but I live in the north of France,and it's hard to find a sunny dry day, especially in winter. Coup de cœur pour Teresa Lim, qui brode les vues de ses voyages au lieu de dessiner ou de prendre des photos. Même si je ne suis pas prête à faire de même, cela me donne envie de me remettre à la broderie traditionelle.